Law students interested in advancing their advocacy skills in a courtroom setting can participate in KU Law's Mock Trial Program. Through classroom, courtroom and competition experience, students are exposed to advanced evidence and trial techniques and participate in simulated trials. While moot court replicates the appellate setting, mock trials allow students to practice lower-court trials. They represent a party, prepare a case for trial and try the case to a jury. KU Law offers both an in-house Mock Trial Competition course and a Mock Trial Council that represents the school in national competitions. The Mock Trial Competition course is open to students during their second and third years of law school. Members of the Mock Trial Council are selected from those students who excel in the in-house Mock Trial Competition course. The University of Kansas Mock Trial Team also offers a mock trial experience for undergraduate students of all majors. Many KU Law Mock Trial participants got their start in undergraduate programs. "My mock trial experience gave me great context for understanding the content I was learning in my courses. Mock trial also gave me practical knowledge about trials that most law students do not learn until their second or third year of law school. I learned the basic structure of a trial, how to give opening and closing statements, how to question both expert and lay witnesses, how to make objections and respond to them using the Federal Rules of Evidence, and how to have proper decorum in a courtroom. I also learned what it is like to work together with a trial team to come up with a case strategy and how to adapt my case strategy in trial when testimony that I wanted in gets excluded." 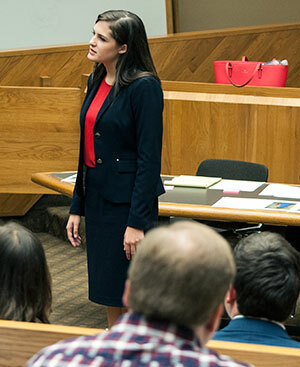 The Mock Trial Competition class covers advanced topics in evidence and advanced trial techniques. The course is available during the fall semester to any student seeking the opportunity to further their trial advocacy skills in opening and closing statements, direct and cross-examination of witnesses and creating and introducing state-of-the-art trial exhibits. Students enrolled in the 1-hour class meet weekly and compete throughout the semester for a place on the Mock Trial Council. Members of the Mock Trial Counsel continue developing their advocacy skills while competing nationally for KU Law in mock trial competitions. Past competitions include: TYLA (Texas Young Lawyers Association) National Mock Trial Competition, Queens County District Attorney’s Office Mock Trial Competition and Buffalo-Niagara Mock Trial Competition.